A 27 year old female, winter climbing in Custs Gully, came off and took a 200m tumbling fall, suffering serious head and arm injuries. In the process, a second climber fell, though he escaped – initially apparently unhurt. Keswick Team were swiftly en route, summoning air support from the Coastguard, given the time it would take to get on scene. 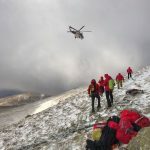 As luck would have it, Rescue 936 from Caernarfon was at Patterdale MRT’s base, having just finished a rescue on Helvellyn. Patterdale were able to mobilise 5 members and a doctor, to fly direct to the scene, thereby saving time, and giving the casualty more immediate assistance. Keswick team members continued up the hill, in case circumstances required a land evacuation. The Patterdale members, doctor and the paramedic from the aircraft treated both casualties at the scene, who were then flown to Furness General Hospital for treatment. The Patterdale members then made their way down to Seathwaite with KMRT members, to meet up with two Patterdale vehicles which had driven round to pick them up. Keswick Team members returned to base, after what has been a challenging weekend. Thanks to Patterdale team for their timely assistance, and Rescue 936 for shortening what would have been a long carry out.